Wants to be die hard in the white house, but doesn’t have the same qualities at all. A movie that has nothing more to offer other than a storyline of terrorists breaking into the white house. this one has lousy action and characters both. the story is extremely weak ans assembled from the parts of other, better films. Instead of being die hard in the white house, this film feels like the end of Salt added with the beginning of X2, stretched for an entire film. There’s a reason why those movies only featured one scene in The White House. spending an entire movie there is limiting, and unless there’s a strong story behind it, like Murder At 1600 had, it’s an idea with very small potential. 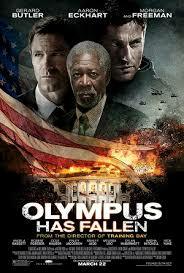 Olympus Has Fallen is clearly an attempt at making Die Hard in the white house. That means there’s one guy who is running around the halls, killing terrorists and avoiding being captured. He’s on his own though, because everyone around him has been killed. And that’s about as far as the storyline goes. It worked for die hard for a whole slew of reasons. The writers of this movie should have taken the time to figure out what those reasons were, because Olympus Has Fallen really has just about none of them. The first reason why Die Hard worked and this movie does not is because there was a legitimate explanation for why john McCclane wouldn’t be at the party with everyone else when the terrorists took it over. He was just in from out of town, not a part of the company having the party, and not really in the mood to socialize. Here, in Olympus Has Fallen, Gerard Butler’s character, Mike Banning, is part of a team of agents who are outside of the white house when it is attacked. There’s no reason why he should survive and every other member of his team should not, and yet all around him bodies fall down and he somehow keeps carrying on. a second reason is the lack of different locations. an action movie needs to take place in different rooms, and have different settings. if every action scene takes place in a hallway that looks exactly the same, where is the interest? in die hard, bruce willis ran all around the building, duking it out with the terrorists on floors under construction, board room tables, and even a mechanical room where he hung a guy from a chain. in olympus has fallen, there’s almost no attempt at creating anything interesting for action. but there is one scene. it involves banning finding a secret passage in the walls of the white house and using it to rescue the president’s son. that moment, while reminiscent of the man who lived in the walls in the film the people under the stairs, is still the coolest thing about this movie. if there has been more scenes like it, this could have really been something. not even secret passages, but just different rooms. maybe something in a bedroom, and then another scene on the roof. other then salt, this movie is also much closer to air force one than to die hard. that’s because air force one was also about a terrorist attack on the president, where the other members of the cabinet became important players. in that movie, harrison ford played the president, and glen close, his vice president had to take over and make some important decisions from the ground. here, it’s not the vice president, but the speaker of the house, played by morgan freeman, who is put in charge. it’s a thankless role that freeman isn’t really able to add anything too. besides freeman, there’s also aaron eckhart on tap here as the president. eckhart hasn’t really proven himself to be anything special since the dark knight, and has gone more for a paycheck than for anything worthy of attention. i liked the guy a lot back when he was making indie films like in the company of men and your friends and neighbors. he was even good when he started crossing over into bigger movies like erin brokovich and thank you for smoking. but not, his movies are huge and they are worse than ever. between this film and i, frankenstein, i would definitely say somebody needs to fire their agent. fast. olympus has fallen isn’t all bad. in fact, nearly the entire fast half of the film is kind of good. the opening sequence certainly holds out attention. that’s where the president is on a retreat at camp david and gets into a car accident on his way back home. how the secret service didn’t have the roads cleared, and a car was able to hit them, i have no idea, but even still, the results of the accident are pretty brutal. it’s a good opening scene that grabs our interest and explains the relationship between banning and the president. the other moments that are cool in the first half are when the terrorists attack. these guys arrive in helicopters and start mowing down people on the street, firing away and holding nothing back. then doors in the sides of trucks start opening up and guys with giant machine guns pop out, firing on the white house. it’s all pretty exciting, but none of it is very smart. there’s no attention to detail here, or clever strategies for getting past systems. i got more out of gene hackman manipulating a way past airport security in heist then i did from tons of terrorists finding a way to take over the white house. 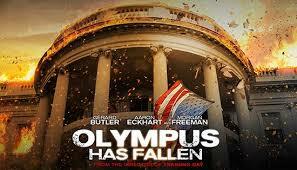 there are lots of problems with olympus has fallen. the first and most important is that the action is lousy. there is no attention to different rooms and settings. i understood the layout of different rooms in the white house better from the opening sequence of x-2 then i did from this entire movie. if the action were good, this movie would have been just fine. take some of the action movies from the nineties, like passenger 57, for examples. the story doesn’t need to be great if the action makes up for it. but here, neither story nor action is anything special, and the movie keeps leaving us waiting for something interesting to happen.